Today was my first pay day as a teacher who makes a lot of money (and well, as a teacher, you know that really isn’t ALL that much ha-ha). This week has actually flown by and has been filled with a lot of little fiascos that take way more work than they really should. Please excuse the mini-vent session and laugh at my small stupidities along the way :). I finally got a cell phone, although I’m still trying to figure out how to use the internet on it because I never even did that in the United States. It was a pretty big fiasco trying to get a cell phone through my teachers, because they don’t know a lot about cell phones themselves, plus they were trying to explain things to me in English. I was REALLY glad when it was done! But even though I got the cheapest phone, it is actually pretty high tech. It has a Japanese and English dictionary for when I get in a bind, I can watch TV on it apparently once I figure that out, and a lot of other small features that I never imagined a phone to have! After the phone fiasco comes the bike fiasco. I had a bike that I traded a friend for, but it had two locks on it. We only had the key to one. So, it’s been a big long issue of thinking of ways to get this lock off. Finally, a teacher at my school offered to help me bring it to the bike shop for them to cut it off. Turns out, we really only had to bring it to the school and the maintenance man cut it off with a big pruner-type tool haha. And I thought I was home free after two weeks. Sooooo I go to ride the bike home yesterday, and I had overlooked one small problem…the tires were flat (duh…it sat there for two years, what was I thinking?!) so I had to walk to the bike the distance back to my house (about a 55 minute walk uphill). I sweated through two shirts! Then I rummaged through my storage shed to find a pump. First one…broken. Second one….SOOO small!! I pumped forever and ever, and the wheels look almost full, but still aren’t full enough to hold a person. Not to mention I really don’t ride bikes that often and don’t really know how full they should be. SOOOO I have a pretty (rusty) bike sitting in my apartment parking lot, and still can’t ride it. I’m so annoyed by all of this! I’m going to try to buy a better pump today, and see if that helps…it’s possible the bike might need new tires, but I really can’t tell yet. I wish I had just bought a bike instead of messing with all of this stuff! On the brighter side, Sunday I will be going to Atami for a fireworks show. Fireworks are insane here, nothing compared to what we do for the 4th of July in the United States. It should be a good time. I’m going in the afternoon to spend some time at the beach and hanging out with other ALTs (Assistant Language Teachers) before the fireworks at night. Mt. Fuji was looking pretty stunning today. Because it is rainy season here, it’s basically cloudy every day. Even when it isn’t cloudy and looks like clear blue skies, it seems that Mt. Fuji is still covered in clouds!! Therefore, I’ve only been able to see it about five times despite the fact that I basically live on it. This morning was great! Alright, that is a really long message, but I had to make up for all those days before when I didn’t type anything. You are such an awesome adventure lady! How cool. I admire you so much. Japan... WOW! It sounds like it is even harder than Spain which was more like a little trial run especially with crazy Ellie. 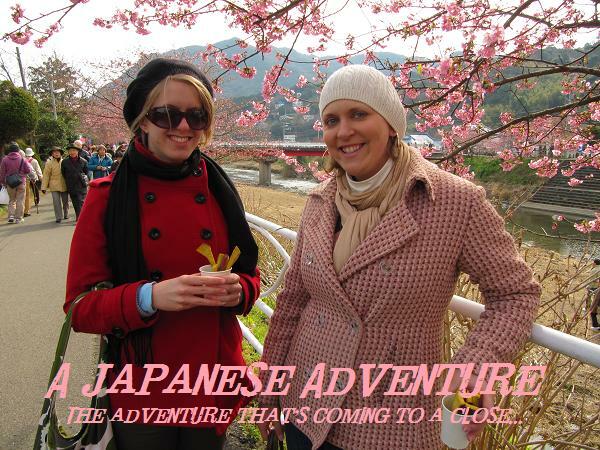 Anyways I love hearing about all of your adventures in Japan. Keep blogging and being awesome!